This cute little chair still has its original company label on it, complete with the date. It was made in 1985. Probably maple, it still had the original stain and finish. 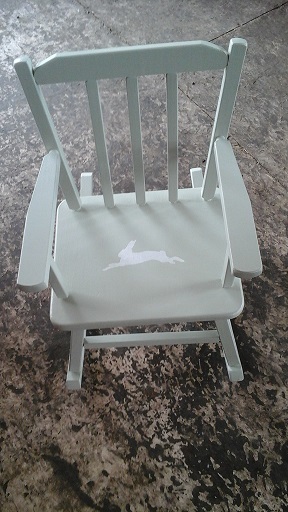 Mint green seemed a good gender neutral color to paint it. The stenciled graphic is from www.thegraphicsfairy.com who so generously offers her graphics for anyone's use. This chair is just so sweet and would be a great addition to a child's room. This should be available on Weds. at the RESCUE REHAB cabin, at the Farmer's Market in beautiful, downtown Delta! The French hare silhouette is a favorite image of mine from Karen. This is so sweet. Thanks Donna, Karen is so generous. I appreciate her graphics so much! Thank you so much, Diana, and thank you for having such a nice link up party! We interrupt this blog post for a ......fire! Flour or Flower, more planters! !